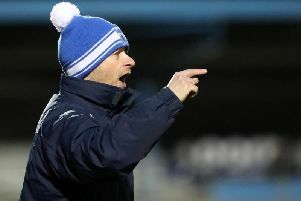 Ballymena United boss David Jeffrey knows the league title aspirations of his side were left in ruins as Warrenpoint Town left the Showgrounds after gaining a 2-1 victory in the Danske Bank Premiership. Jeffrey must wonder how his side went from hammering Coleraine 4-0 before losing 2-0 to Glentoran. They followed this up by thumping Institute 6-1 before going down 2-1 to Warrenpoint at the weekend. That series of results has left United in second place in the league standings - nine points behind leaders Linfield. The Blues come to the Showgrounds on April 5 and what a game that would have been if the Sky Blues had not come up short against the Glens and Warrenpoint. Jeffrey knows the dream of landing Ballymena’s first-ever league title is now dead and buried and the United boss admits staying ahead of third-placed Crusaders is now their main objective in the last five games of the season. “If anyone would have offered me second place at the split, regardless who is ahead or behind us, if they had said you will be second in the league and four points ahead of the team below you I would have said ‘wise up’, he said. “The defeat was a harsh lesson and a simple lesson. “When you are on top you have to finish teams off. “First half we started off as we had finished against Institute with some fantastic football. “We then scored a great goal through Adam Lecky and then we let Warrenpoint in for a goal that, defensively, we should have done better with. “All of that good work came to nothing because we came in at half-time 1-1. “We had opportunities in the first half to be two goals up and the message at half-time was to be careful, keep things tight, look to create and when you get an opportunities you take them. “We are then hit with a sucker-punch and then we pressed and pressed but couldn’t take our chances. Warrenpoint Town manager Stephen McDonnell was delighted his side got another win under their belts before this weekend’s Irish Cup semi-final clash with Ballinamallard United. “We just needed to believe because we were causing them problems,” said McDonnell. “We just had to take the opportunities we were creating. “We were excellent at times and we played in the right areas. “The Cup semi-final was on all our minds and this was a free shot. “The main thing is that we came away from here injury-free. “And we have taken the three points, which is pleasing. “It is good from a confidence point-of-view heading into what will be for many of the players the biggest game of their careers. And he says the players have responded well in the games leading up to the semi-final. Subs (not used): McGrandles, Lynch, Byrne, Magowan.